Circa 1977, Western Australian Government Railways started repainting their locos in the corporate "Westrail" scheme but a bumper wheat harvest meant that there was a loco shortage so a number of locos were running around in a pinkish undercoat colour for a month or so until the locos could be released for the final repaint. I don't know how the natural weathering would have affected the paint between coats as such! Victorian Railways in part of the rebuilding after World War II ordered 70 4-6-4 locomotives as their passenger R class among other locomotives. They did not last long as prime passenger power as dieselisation was concurrently taking place so these locos spent much of their lives hauling freight round Victoria despite being highly unsuited with large driver wheels for general goods work. Victorian Railways in part of the rebuilding after World War II ordered 70 4-6-4 locomotives as their passenger R class. They did not last long as prime passenger power as dieselisation was concurrently taking place so these locos spent much of their lives hauling freight round Victoria despite being highly unsuited with large driver wheels for general goods work. Maine Central regeared some E-7s and used them in freight service after the cessation of passenger service. The New Haven's PA-1s ran out their final years in freight service. They were regular power on a job known as the "Drop" which worked the non-electrified yards and sidings between the New York City area and New Haven. They also appeared on piggyback trains between New York and Boston on a regular basis. New Haven was one of the pioneers in the dual-service diesel concept when they used their DL-109s on passenger trains in the daytime and freights at night. Here's one you haven't covered yet. 2 x HST Power Units recovering failed Loco and train. Last night the sleeper from Paddington failed at Newton Abbot. (The class 57 'Totnes Castle developed a bad fault). This morning 2 x HST Power cars were sent out back to back from Laira Depot and hauled the whole lot back to Laira to get the fault sorted. Seemed strange as it passed the South Devon Railway at Totnes. PRR very famously tried E units on some of the TrucTrain consists, as the need for passenger power began to fall off. This led to comedy fairly quickly as freight engineers, used to automatic backward transition on F units, created Flashover City when trying to operate E units a little forgetfully. The Erie Railroad used Pacifics on branchlines for freight service on weekends when they were not needed for commuter service. On the New York Central, the K-11 Class Pacifics with 70" Drivers were almost exclusively used in Freight Service. Also the Atlantic Coast Line Pacifics were used in Fast Freight (read perishable fruit) service from Florida to the Northeast. The South Australian Railways 600 class Pacifics were nearly all based in Tailem Bend in the last days of steam but right through their lives, they were allocated freight and passenger trains with impugnity. Similarly for the SAR 620 class although there were many more passenger trains that the Adelaide based units could be allocated to so the freight haulage did not occur till later in those locomotives careers. It was common for Electric Locos in New South Wales double head with mainline and branchline diesels particularly on the steeply graded section from Gosford to Enfield in Sydney up till the late 1970’s when electrification was extended to Newcastle and the need for loco changes lapsed. I witnessed a 46 class (3600 HP electric) and a 48 class (900 HP branchline unit) leaving Gosford in September 1970. Louisville and Nashville Railroad rejuvenated the General in 1961 to mark the centenary of the famous train chase of the American Civil War. SIerra Railroad also still has No 3 which was the engine in Casey Jones, Petticoat Junction and Green Acres TV series which would be running alongside diesels as well. A number of the “Mega Railroads” in the USA have painted different diesel locomotives in Heritage Schemes so it has occurred that modern units so 21st Century locomotives have appeared in Susquehanna, Missouri Pacific, Reading, Pennsylvania, New York Central, Southern Pacific Daylight Colours, Southern Railway, Nickel Plate and Rio Grande to name a few well after the demise of those railroads, Recently a class 66 has been painted in British Rail blue! I personally witnessed a CN Wide nosed (Safety Cab GP40) running long end forward through Toronto Union Station on either a transfer freight or a local. Victorian Railways 3rd series X class and C class were designed as effectively single ended locomotives but have often run long hood forward when turning facilities were not available for considerable distances. There were 16 single ended cab locomotives in the South Australian Railways and I witnessed a couple of these hauling small trains or travelling with a brake van for at least 7 miles, the distance between one major yard and another. The Wellsville, Addison and Galeton shortline in Pennsylvania and New York operated single F7 units on light trains and consequently ran the length of the line backwards, admittedly on rare occasions. Many locos over the years have been built with either Silver or Black underframes and bogies. Union Pacific went on a bit of an economy binge to see if they could keep up their corporate image with less cleaning. Subsequently they painted the bogies of their diesel locos in a gray/grey colour instead of silver. 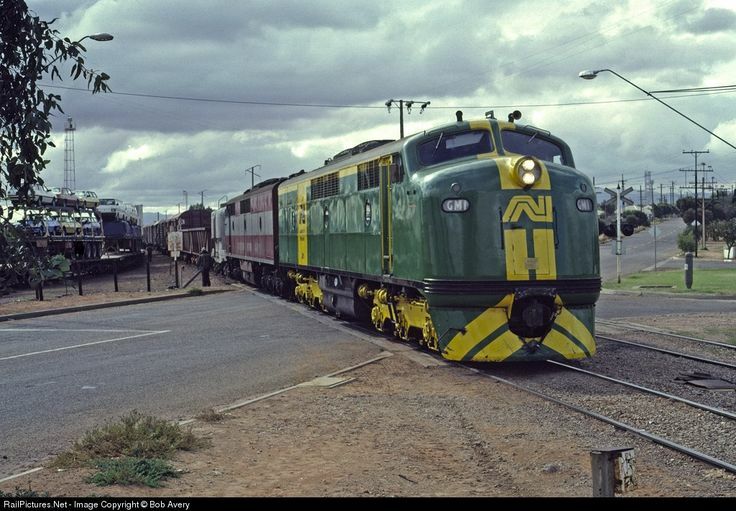 South Australian Railways were taken over by the Commonwealth Government in the late 70’s and part of the corporate change was the painting of bogies yellow. You can see an example at https://i.pinimg.com/736x/6f/d8/5a/6fd85a1389851825ec1b83d31f4504d3.jpg on a GM class loco and various items of rollingstock was similarly treated before common sense prevailed and loco bogies on new locos or repainted older locos were painted in black. The US Department of Transportation ran a huge 10 miles of track in a Loop. This was used for train and loco testing purposes. The concept of Merry Go Round Trains for Coal and Wheat is used often around the world to avoid runarounds and shunting but there are a couple of examples where there are actual loops built into the balloon with fairly sharp radii by railway standards.